This is going to be my second holiday sweater. 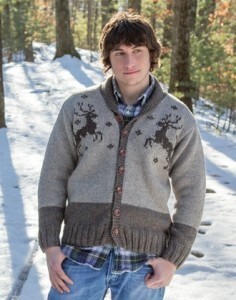 Two features have really drawn me to this sweater: one, the colorblocking, which will visually make the sweater look smaller even though it’s oversized, and two, the prancing deer motif, which gives the sweater a lot more movement than the traditional standing deer fair-isle motif. It’s active and sporty in appearance, while also being big and cuddly. That’s a lot to pack into one garment! I have some taupe commercially made yarn from Araucania for the lighter part of the body, and I wanted to create some forest colored hand-spun for the darker parts. There is a lot of forest here in Oregon, and I wanted to really do justice to the depth of color and variety in conifers that we have around here. 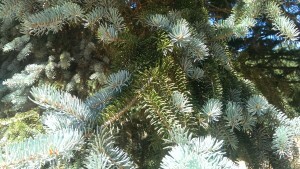 This is a blue spruce that’s growing in front of our house. 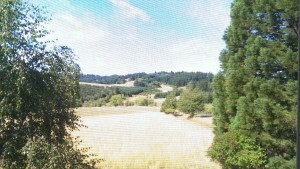 The new growth is a beautiful sage-y blue green, and the older growth is more of a yellow green. 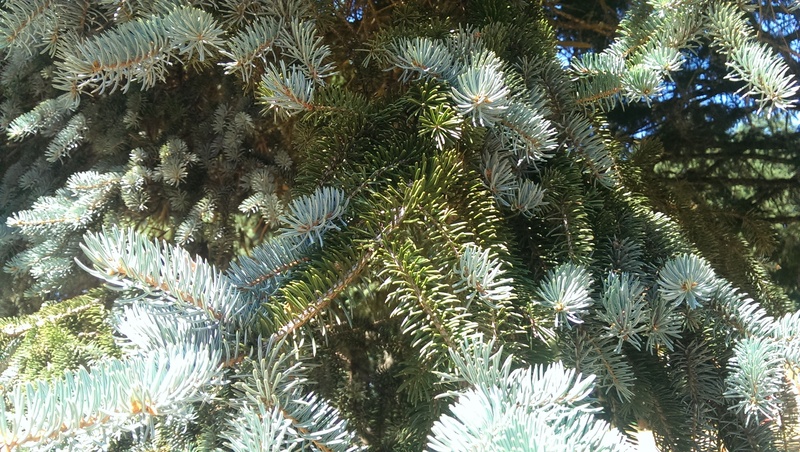 The Douglas firs around our house are more of a cyan, and there is a dramatic difference in shade between where the sun strikes the needles and the ones in shadow. 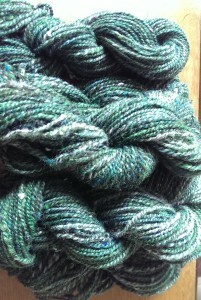 I ended up blending five distinct color ways, and then blending those color ways further to create this yarn. I ended up deciding on a fat two-ply to match the weight of my commercial yarn, rather than a three-ply, because I wanted to leave enough variation in color once it was knit up. Here is my swatch. 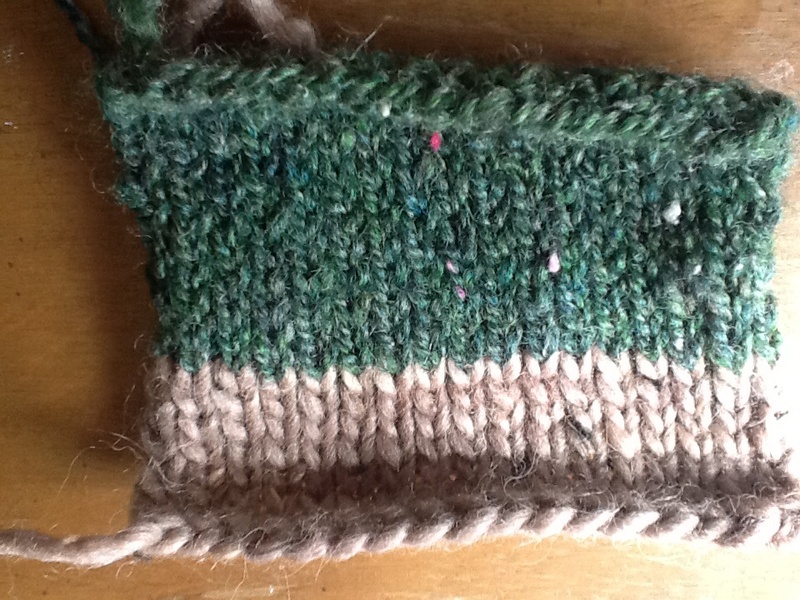 The commercial yarn has some striation to it, which goes really well with my handspun, and also has some pink undertones to it, which compliments the greens nicely. It’s being knit on #9 US needles, so it’s coming along quickly. I’m debating on whether or not to add some knit-in pockets. I think what I love most about this project is that it’s a representation of the trees in my neighborhood, in the summer, when it was pretty hot out, and I’ll be able to keep a little bit of that summertime feel with me once winter comes. It’s a little put-up job, like a jar of pickles or some jam. Really liked your descriptions of color here. I love the idea of “a little put-up job” of color. For me getting handspun color just right is a big challenge. Yours looks beautiful. Also, nice illustration of not just the knitting thought process but also how to use handspun and commercial yarn together successfully. Sal, this project is going to be gorgeous. Thanks Rach. I think my very favorite thing about handspinning is that it’s possible to add so much depth to the yarn, rather than just a monochrome. And I think one of the benefits of using handspun with commercial is that I don’t have to spin a whole sweater’s worth of yarn and have crafty ADD kick in.